Hi, I bought Ultimaker 2 about one year. Recently, I found the nozzle blocked more often than before. 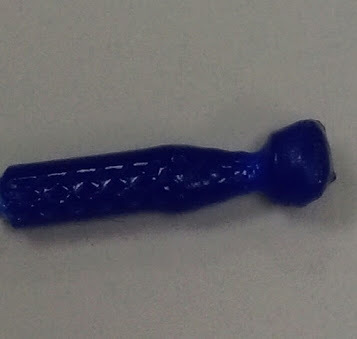 And every times I pull out the bowden tube, the shape of PLA filament is look like the following img. Is it because the wrong temperature or other problem? Have you checked your Teflon coupler? How many hours of printing to you have? I did some adjustment, it seems worked. I put the 3D models closer and "print all at once"
I think he meant how many hours total do you have on that Teflon coupler.. it is a wear and tear item that needs replaced occasionally based on usage. yea thats.. way past the life cycle of the ptfe insulator.